May I stream a Netflix film in my classroom? No. When a person signs a licensing agreement with Netflix, s/he agrees to only stream videos in the privacy of his/her home. The Netflix user agreement prevails over classroom exceptions to copyright law. Netflix does not offer an institutional license, so the Library is unable to provide a licensed source for Netflix. Try searching our licensed streaming video databases for documentaries that you and your students may access in class or from home. Would I be able to digitize and stream a DVD I own for my students to view online? No. It is illegal to re-format media to stream it. A license must be obtained if you wish to stream any form of media on a website or CMS. Is it legal to make a copy of a rental film in order to use it again later? No, that would infringe on the right licensed to the rental agency. May I edit together portions of videos? It depends. If you are using very brief clips from several videos, and they are for a one-time use, this would probably be permissible under fair use. If you are using several segments from the same video and/or expect to use it in future semesters, then permission would need to be obtained. May an auditorium or other large space be used to show a film labeled "Home Use Only" to a class or several sections of a course? Yes, so long as the presentation is not open to the public or the college community at large AND is part of the syllabus. 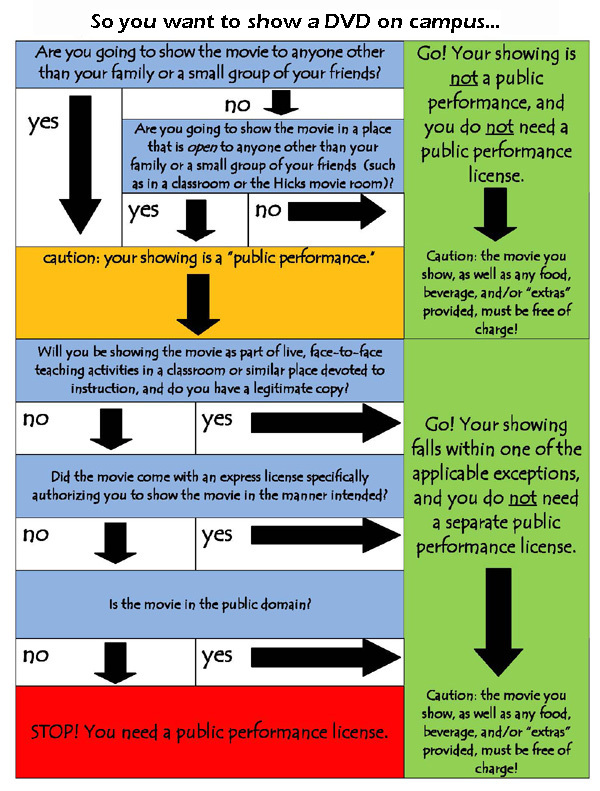 Presentation for entertainment purposes requires permission or a license. How does the "face-to-face" instruction requirement affect the practice of placing films on reserve and assigning them to students? Library course reserves are considered an extension of the classroom, so Fair Use principles apply to materials placed on reserve.